At-Tamaa’im (singular: Tameemah): It is something that is hung on children to protect them from the evil-eye. However, if what is hung is from the Qur’aan, then some of the Salaf allowed it, and others did not allow it, and they regarded it to be forbidden – amongst them Ibn Mas’ood (radiyallaahu ‘anhu). Ar-Ruqaa (singular: Ruqyah): This is what is called al-`Azaa’im (recital). There is evidence to show the allowance of Ruqyah that is free from Shirk. The Messenger (salallaahu ‘alaihi wassallam) allowed it for remedy from the evil-eye and poisonous stings and bites. At-Tiwalah: It is something that the people make, and claim that it makes a woman love her husband, or a man love his women. 1. The meanings of Ruqaa and Tamaa’im. 2. The meaning of Tiwalah. 3. That these three are considered to be from Shirk, without exceptions. 4. Performing Ruqyah using the words of al-Haqq (the words of Allaah) to remedy the evil-eye and poisonous stings is not forbidden. 5. If am amulet (Tameemah) is made from the Qur’aan, then the scholars differ as to whether it is considered to be from the forbidden amulets or not. 6. Hanging or tying bowstrings to animals to repel the evil-eye is from the forbidden categories. 7. There is a severe warning for the one who hangs the string of a bow [as an amulet]. 8. The excellent reward for the one who cuts off the amulet from a person. 9. The speech of Ibraaheem an-Nakha`ee does not contradict the “difference of opinion” previously stated because he is referring here to the companions of Abdullaah b. Mas’ood. Reported by Ahmad in al-Musnad, no. 3604; Sunan Abee Daawood, no. 3883; Ibn Hibbaan in his Saheeh, no. 6090; Mustadrak ‘alas-Saheehayn, no. 8290; and others. 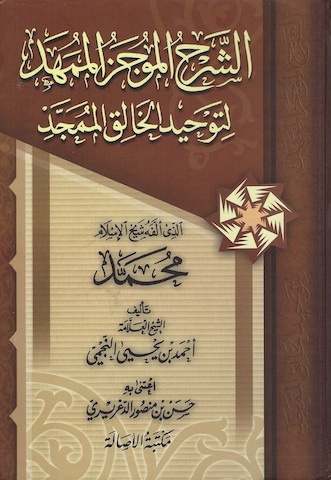 Al-Albaanee graded it Saheeh in Saheeh al-Jaami’, no. 1233, see Silsilah al-Ahaadeeth as-Saheehah, no. 331. An-Nasaa’ee in al-Mujtabaa, no. 4079; Sunan al-Kubraa of an-Nasaa’ee, no. 3542; Sunan al-Kubraa of al-Bayhaqee, no. 19395; at-Tirmidhee, no. 2072 and others. Al-Albaanee graded it Saheeh in Saheeh at-Tirmidhee. Reported by Ibn Abee Shaybah in al-Musannaf, no. 23473. Ar-Ruqaa is the plural of Ruqyah, and Ruqyah is to seek protection (or refuge) – this occurs when a sick person seeks protection. So he recites something from the Qur’aan, and the sick person is blown over – Ruqyah also includes the recitations of supplications of incantations found in the Sunnah. “Ibraaheem (`alaihis salaam) would would seek protection for Ismaa’eel and Ishaaq with it.” (al-Bukhaaree). 1. That is must be from the Book and the Sunnah. 2. That is must be done in the Arabic language. 3. That one must not believe that the Ruqyah itself is the cure – rather it a means. As for Tamaa’im: then it is the plural of Tameemah (amulet or charm) – and the intent here is something that is hung or worn by a person seeking in that to bring about a benefit or to repel harm. The Salaf differed with respect to the permissibility of wearing the Tameemah (amulet) if it was Quranic: Is it permitted or not? 1. The verses of the Qur’aan are exposed to abuse – a person, man or woman, wears it whilst relieving themselves in the toilet area. Or a woman wears it whilst menstruating – or they wear it whilst engaging in sexual relations – and this is forbidden. 2. The wearing of the Tamaa’im is not reported from the Prophet (salallaahu ‘alaihi wassallam). Rather what is reported from him is Ruqyah. As for other than Ruqyah such as writing of Quranic verses and wiping them out and so on, then that is not legislated or permitted to do. As for “writing and wiping out”, then that is to write a write a verse in a vessel or bowl and subsequently wipe is out with water – then the afflicted person drinks it. This has not been reported from the Prophet or his Companions. Then the Ruqyah mentioned here refers to the forbidden type which contains in it incantations of protection (Ta’aaweedh) by using names that are unknown. It is well-known that when people wear amulets, their hearts get attached get attached to them – so one believes that that it is this amulet that protects him from dangers and keep him safe from fear and terror – and this is Shirk for sure. As for Tiwalah: then that is what is made to cause a man to love his woman, or a woman to love her husband. And this is called Hidaayah by us (i.e. the Arabs). All of this is impermissible. Those who partake in this have involved themselves in a type of Magic. And Magic (Sihr) is of-course forbidden, and none would consider such a deed except an unbeliever. Al-Watar is a string that is used on a bow to give it the strength. So when one was afflicted and they wished to remove the affliction, they would take it and place it around the neck of the animal claiming that it will protect it from the evil-eye, or from the devils. And this, without doubt, is Shirk. As for his saying: “or any necklace” – this means any type of necklace is forbidden whilst believing those things. And, overwhelmingly, those who put these necklaces on the animals, they put them on due to these beliefs. I (Shaikh an-Najmee) say: There is difference between Ruqyah and `Azeemah. `Azeemah (plural: `Azaa’im) is what is written down for the purpose of carrying around. Ruqyah is when a Raaqee (one performing Ruqyah) recites and blows (like spitting) but without writing anything. So the Ruqyah is permissible – and as for the `Azaa’im and Tamaa’im (written amulets and charms), they are forbidden as previously mentioned. “The Scholars are agreed upon the permissibility of Ruqyah in the presence of three conditions: 1. That it be from the Words of Allaah – by His Names and Attributes. 2. In the Arabic language. Someone who is Al-Mukhadram is considered as the second level after the Sahaabah, he is above the Taabi’een. A Mukhadram is someone who was present at the time of the Prophet (salallaahu ‘alaihi wassallam), embraced Islaam but did not meet him – such as: Abdullaah b. `Useelah, Abu `Uthmaan an-Nahdee, Abu Muslim al-Khawlaanee, Kumail b. Ziyaad, Abu Rajaa al-`Ataaradee and other than them who are many in number, reaching somewhere in the region of forty men. The one who wears something believing that it will bring about benefit or repel harm – then with this doctrine he has out his belief into that which he is wearing, and due to this, Allaah entrusts him (i.e. leaves him) to it. And this is a severe threat and warning to the one who commits Shirk with Allaah by wearing these amulets and believing in them. As for Ruwaifi` is the son of Thaabit b. as-Sakan b. Adiyy b. Haarithah al-Ansaaree al-Madanee. A companion, who lived in Egypt. He was appointed as the governor of Burqah (part of modern day Libya/Tunisia – was the last Roman stronghold in Africa before it fell) and died there in 56H. I say: that the tying of knots in the beard is to plait is out of pride and self elevation – as for generally taking care of it, combing it and grooming it, then this is not forbidden, as Shaikh Ibn Baaz (rahimahullaah) stated in his discussion of the topic. The second affair: Putting the bowstring around the neck. Al-Watar: is a string that brings together the two ends of a bow, and an arrow is place there. When is became old and worn out, they would take it off and replace it. Then they would take it and place it around the neck of a camel or another beast, claiming it would protect it from the evil-eye and the devils. But, in reality, it is Allaah (the Most High) who protects from harm and it is He who bring about benefit. In this hadeeth, there is also a forbiddance of purifying and cleansing oneself after using the toilet with the dung of animals or their bones. So the Messenger (salallaahu `alaihi wassallam) freed himself from those who do that. The hadeeth has something of weakness in it (layyin), however Al-Albaanee (rahimahullaah) authenticated it. The hadeeth also contains a sign from the signs of Prophethood, and that is in his saying to Ruwaifi` (radiyallaahu `anhu): “Perhaps you will have a long life.” And indeed he did have a long life. I say: No doubt, freeing a Muslim from Shirk and giving him understanding of Tawheed is immensely rewarding – and in that we there is a greater reward than freeing a slave. Firstly: Due to the generally of the narrations that forbade using them. Secondly: To block the avenues that lead to Shirk. So the Quranic Mushaf is not to to be worn, nor verses from it, nor are the Prophetic Hadeeth to be worn, nor talismans and bones. And anything that is worn other than the Qur’aan is considered as Shirk. So all of that is Shirk. Tirmidhee, Abu Daawud, Ahmad, from the narration of Ibn `Abbaas. Al-Bukhaaree and Muslim, from the narration of Abu Sa`eed.